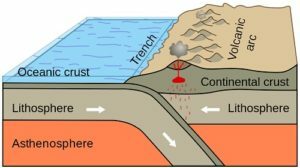 The meaning of plate tectonics and what their role on our planet. The various kinds of motion of plate tectonics. The distinctiveness of lithosphere and asthenosphere, and their functions. The comparison and corresponding functions of continental lithosphere and oceanic lithosphere. Plate tectonics is a theory that helps give an explanation to the present location of our continents, landforms, and bodies of water. Plate tectonics are also responsible for the locations of natural hazards that can occur in the future, specifically earthquakes. Earthquakes are telling that the lithosphere is shattered into plates that gradually move over a less stronger layer which is the asthenosphere. This is where the plates are making their respective actions and the most important geological processes happen, including the production of earthquakes, mountain belts, and volcanoes. For you to build a comprehension on the topic of plate tectonics, it is essential for you to know what composes it. The lithosphere is the outer part of our planet. It is very solid and includes the brittle portion of the crust and mantle, the earth’s outermost layers. It is borders by the asthenosphere below and the atmosphere above. Oceanic lithosphere – divergent plate boundaries are responsible for the formation of the ocean lithosphere. These regions, which can be found on the mid-ocean ridges, signify locations where rising magma produces new crusts in the ocean. As lava flows from the ridges of volcanoes, it cools very quickly, which creates extrusive igneous rock. Continental lithosphere – convergent plate boundaries produce this kind of lithosphere. This region affects locations where the oceanic plates move below the continental plates. In this part of the module, we will differentiate continental and oceanic plates from each other for the purpose of mastering types of plates. It is essential to know the characteristics of each plate. Continental plates have less density compared to oceanic plates. The reason for this is that oceanic plates contain substantial ferromagnetic components. The oceanic plates density is around 200 pounds per cubic foot, whereas continental plates range from 162 to 172 pounds per cubic foot. In terms of age, continental plates are the oldest, dating back billions of years. We all know that our earth is mostly composed of water and with that, it is the same with plates. Most of the plates on our planet are oceanic plates. 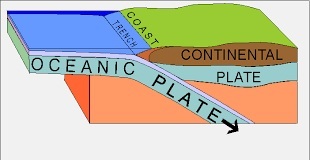 Having said that, oceanic plates are much less thick than continental plates. It is a layer in our planet’s surface which is found beneath the lithosphere. It is a layer of solid rock which has so much pressure and heat that the rocks can “flow” like liquid. The rocks are much less dense in the asthenosphere than the rocks in the lithosphere. This lets the tectonic plates in the lithosphere move around the earth’s surface by simply “floating” on the various rocks that are flowing slowly like a liquid. Geologists have recently created theories to elaborate the transformation that happens in the asthenosphere when plates start to move toward each other. Experts believe that the actions that take place in the asthenosphere are responsible for keeping the plates of our planet from becoming active. How the Plate Tectonic Theory Has Been Formulated? The uneven surface of the earth and the fragile ocean floor. It verifies the magnetic field of our planet. 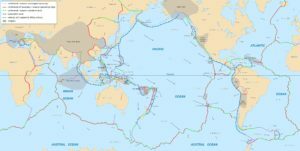 The record of our planet’s earthquakes and volcanic movements, which are focused on our ocean and mountain range areas. Divergent boundaries – an area in which the newest crust is produced as the plates move apart from each other. Convergent boundaries – it is the place where the crust is split as one plate plunges beneath the other. It is the primary reason for ocean trenches, mountain ranges, and volcanoes all over the world. Transform boundaries – it is the location where the crust is neither created nor diminished as the plates glide parallel past each other. This type of boundary is responsible for the majority of earthquakes that are happen. Plate boundary waves – consists of wide belts, it is still being studied by the experts because its effect on the plates is still uncertain. To conclude, we know now that plate tectonics involved a lot of tremendous processes before they were formed. They are also crucial in the functioning of the components of our planet because they have their own purpose and they are a good way to see the inner workings and movements of our planet.